Pink Dragon Ladies Team Sweden: Who are the Pink Dragon Ladies Team Sweden? 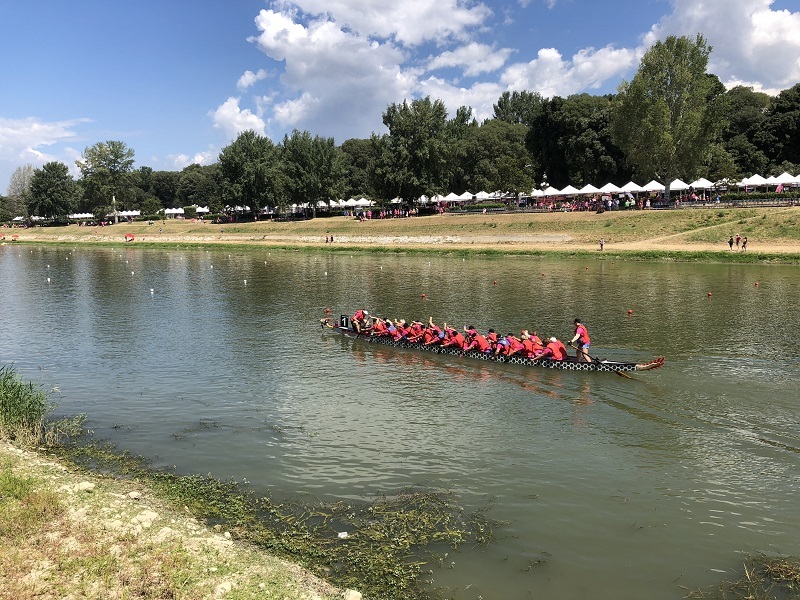 What is The IBCPC Dragon Boat Festival in Florence? Have you ever asked yourself who those paddling ladies in pink clothes in Malmö are? What are they representing? Who are the Pink Dragon Ladies Team Sweden? In the beginning of July 2018 our Magazine followed this great team from Sweden on their trip and Dragon Boat races in Florence (Firenze) in Italy. More information about them you can find at their official website: www.pinkdragonladies.se . In this article we write about them and the IBCPC Dragon Boat Festival in Italy. One very interesting part of this festival is The Pink Parade of Nations and that is what we followed from the start to the end. 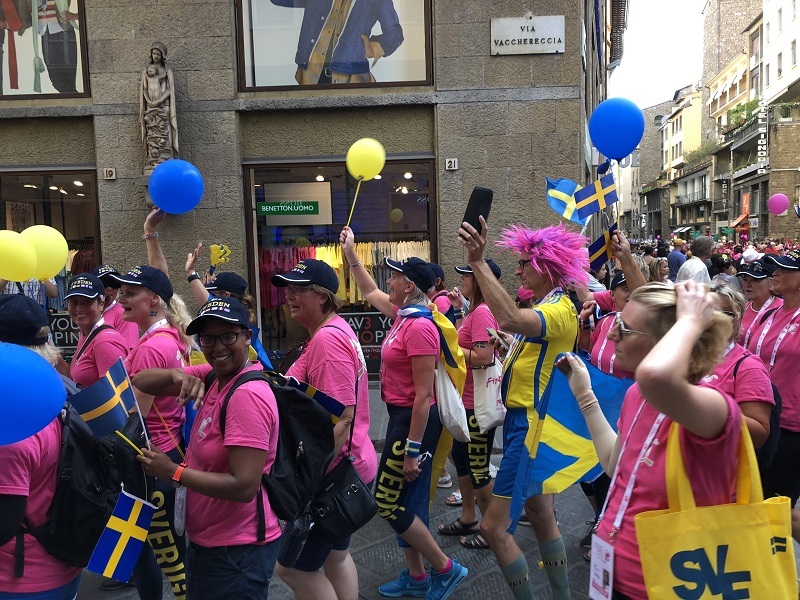 The IBCPC Dragon Boat Festival Pink Parade of Nations in Florence – Here we can see the happy Swedish team walking on the streets of the central city. 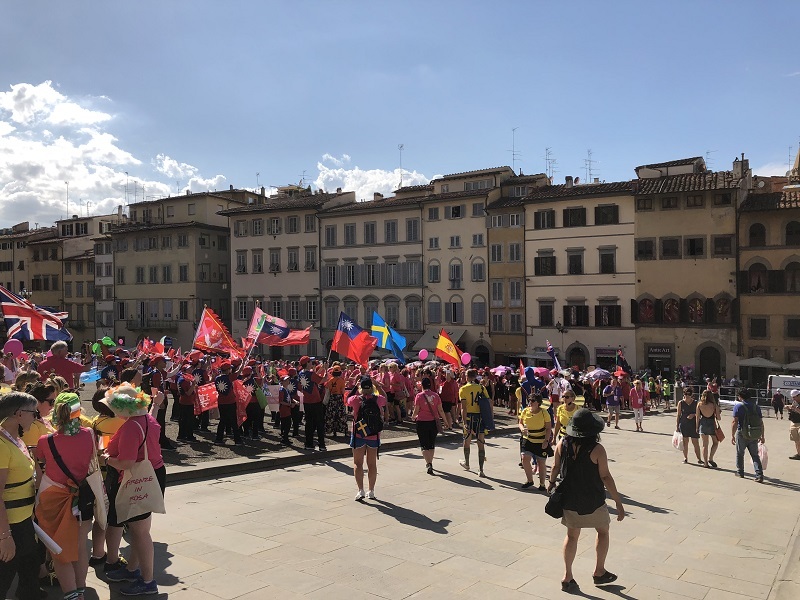 The Pink Parade of Nations In Florence started at Piazza Pitti where all teams from different countries from the whole world gathered together and started walking towards Piazza della Signoria where they finally could hear and sing their own national anthems. Pink Dragon Ladies Team Sweden started the parade with all other teams from different countries from the whole world at Piazza Pitti in Florence. 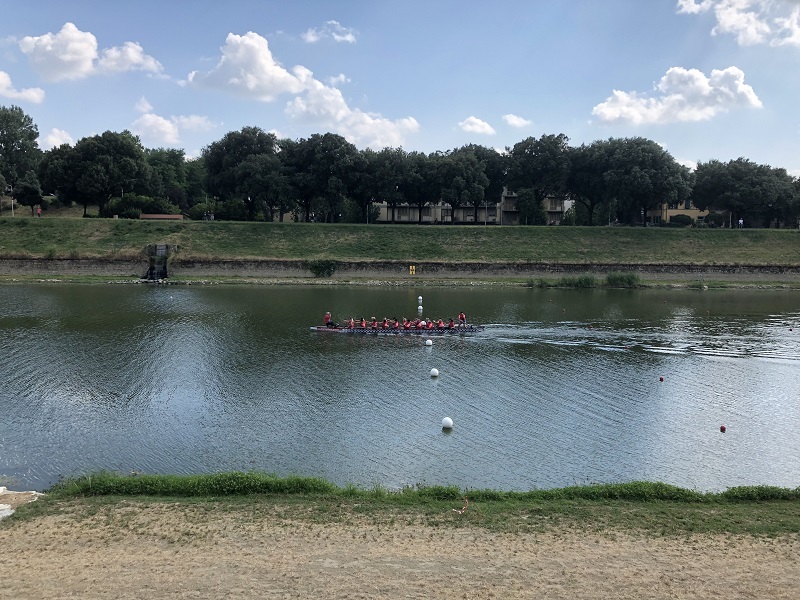 On July 4th they had a warming up training with their Dragon boats in the Arno river. The river is right in the middle of the Cascine Park that is Florence’s largest public park with an area of about 130 hectares. Pink Dragon Ladies Team Sweden: warming up training in the Arno river, right in the middle of the Cascine Park that is Florence’s largest public park. The temperature outside was very high but nothing could stop the warming up training. Everyone simply wanted to do their best in the races. They ignored the heat and enjoyed. On July 7th and 8th there were two races where 129 teams participated. The Pink Dragon Ladies Team Sweden was among the faster ones which was good result thanks to the hard training sessions in Malmö. We decided to use this image only so we can remember the moment when our Swedish ladies were on their way to the start line at the Arno river. At the end, all participants got their medals and they all together could feel one and same winner-feeling. Before the closing ceremony there was a BCS Flower Ceremony which was a great experience for each one participant. Everyone threw a flower in the Arno river and many feelings were in the air. We also could see some tears. Before and after the races but also during all days in Florence, all teams enjoyed in different restaurants with great and tasty food. Italian or other but it was very good. 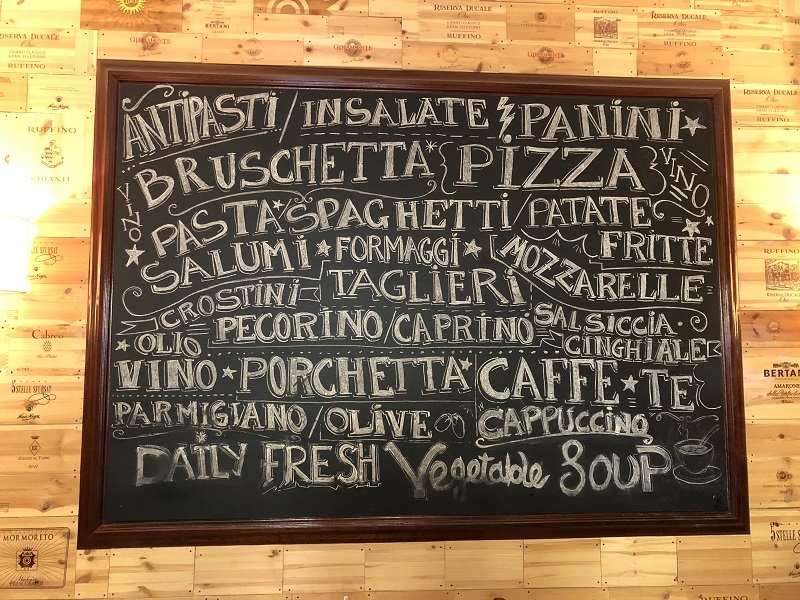 Some of the restaurants can be found close to the Brunelleschi’s Dome . Before and after the races and also during all days in Florence, all teams enjoyed in different restaurants with great and tasty food. Also we, Justfindit.se Magazine took every opportunity to enjoy the food and ice creams in every corner of this beautiful city. One more detail now at the end of this story: One day, when we did not follow our Pink Dragon Ladies Team Sweden, we visited Viareggio, a city on the Mediterranean coast and enjoyed some swim. On the way back to Florence we also visited Pisa and the famous Tower in Pisa.